Pumpers are just using a single insulin type that will be infused by their pump depending on the programmed basal profile. Additionally the pump will shed insulin units on demand to cover a carb intake or for correction purposes. 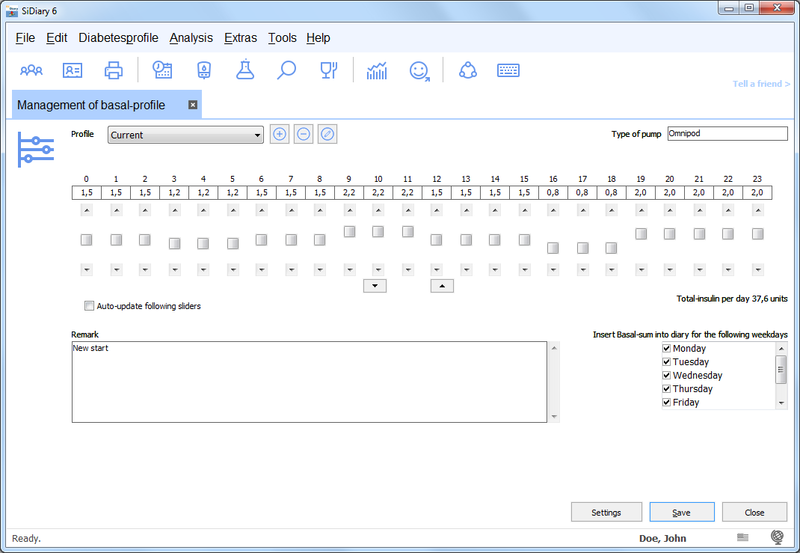 SiDiary can handle an unlimited number of basal profiles. This is interesting for shift workers or people who have different requirements for weekdays and weekend. You can assign your basal profiles to the appropriate weekdays, SiDiary will insert the sum for these days to your daily log automatically as a default value (that can be changed of course). Sometimes it can be useful to use a temporary basal profile, i.e. for exercises. This possibility is included with SiDiary and you can track such circumstances as well as that you have disconnected your pump for a while. (i.e. at the beach or for diving). Pumpers have to maintain their pump frequently: Changes of batteries, ampoules and catheters must be done and of course they can be tracked easily in the grid entry, with abbreviations like CB, CA, Off, On etc. The statistics will show you the total numbers for these events which will give you an overview of needed materials for a defined time range. SiDiary provides an interesting feature for therapy changes or new adjustments with a pump therapy: Just send your data with the email wizard to your health-care professional. A therapy change or a new base adjustment with a pump is done ideally at home because there you have all of the "real" conditions. Therefore it is pretty good to provide your data contemporary to your doctor. With your electronic log book a simple change can be easily discussed at the phone. Additionally you have the possiblty with SiDiary 6 to remind you automatically on your basal testing with accustic signs and reminder windows. Tip: In SiDiary 6 you can have an additional row for tracking the time of your PED (Press-Eat-Difference). That's the time between your request for a bolus and the beginning of your meal, which can cause a better post-prandial BG. As you know: the more you track, the more benefit you will have from it.